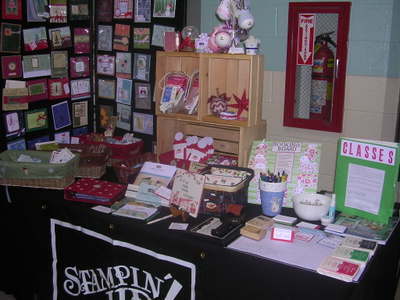 The Wallkill Valley Craft Fair is a pretty big one in our area...there was alot of traffic all day long. Again, I forgot to take a picture of my table BEFORE things started selling and being shifted around, so it doesn't look as nice as when I first started out! This time I used some crates because I had a smaller table and had to find a way to make everything fit on it..crates also give a nice sense of depth as well as provide a way to display things at eye-level for the shoppers! My biggest seller was the nugget boxes and the chocolate bars-this time I make Christmas ones using one of my favorite holiday sets-Festive Favorites! (I'm so relieved that this set is NOT on the retired stamp list) I got this idea from another stamper (but I can't remember who to give proper credit). 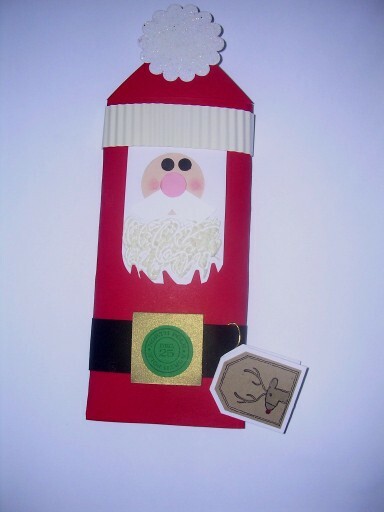 The box slides open, revealing a holiday greeting! I love the idea of spelling out the word "Joy" with the wrapped chocolate nuggets! I must have taken this photo before I decided to add a red brad to Rudoph's nose on the tag! 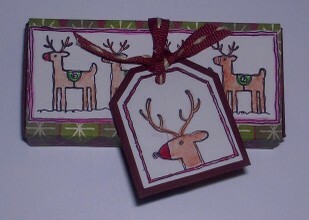 (It was a cute addition) The tag is stamped with to: and from: on the back. A FEW TIPS: the moustache was made with a circle punch-then cutin half; the Scallop Punch was used to make the pom-pom on the hat; the bottom of the beard was made using a corner punch! 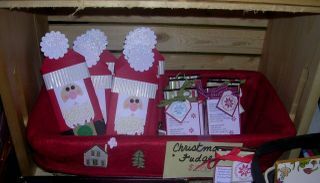 I'm really into the punches this year...there are so many cool things you can create with them! The Perfect Presentation set is hostess set-it will be retired because the new collection will have all new hostess sets you can earn! It's not too late to get this set-simply gather together $300 in orders from you and your friends, and you will earn it! But only until December 31! I'll be back later with more projects I made for the craft fair to share, so check back again soon! (...domestic duties are calling out to me!). And don't forget to leave a comment so I know you have been here to visit!